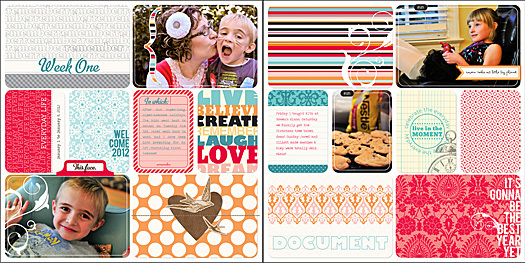 I have completed four pages so far for Project Life 2012 - and of course I’m doing them in digi! :) I chose the Clementine kit for the base pieces, which is available in digital format right here: Clementine Project Life. The heart and stitching are from Crystal Wilkerson. I am LOVING this kit so far, and so excited to document my life in the Project Life way. :) Are you doing PL? Digi, Hybrid, or traditional?